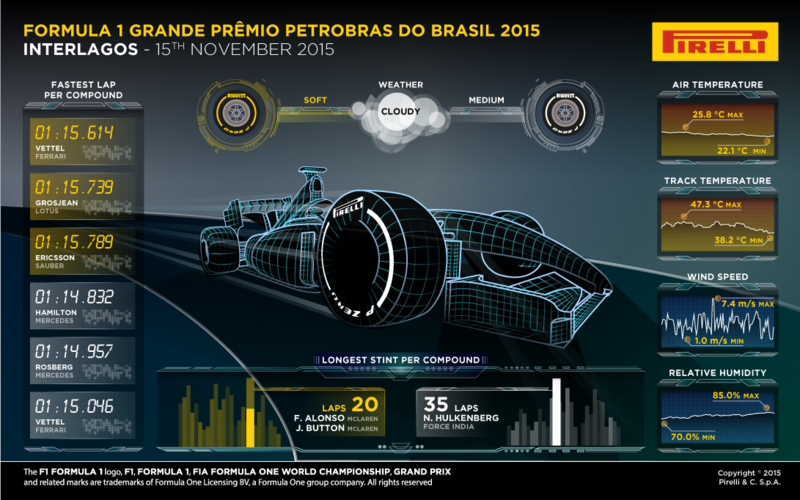 Formula One: F1 2015 stat heaven! 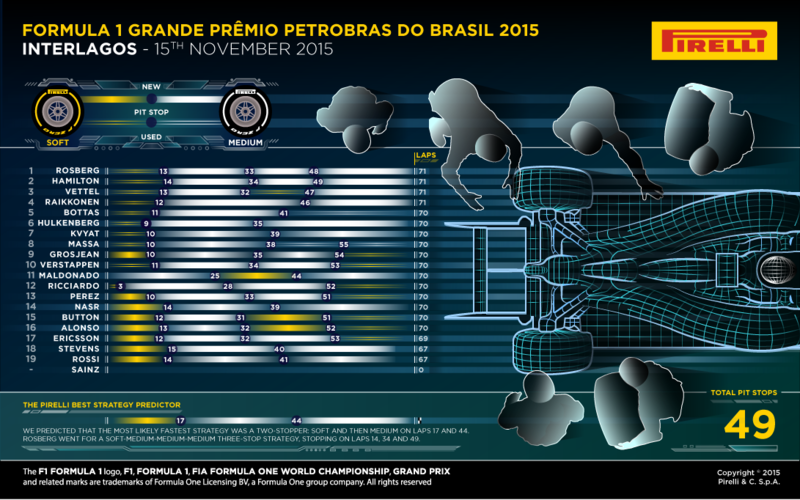 With the 2015 Formula One season complete, Pirelli have put together this series of fantastic infographics to summarise the season. 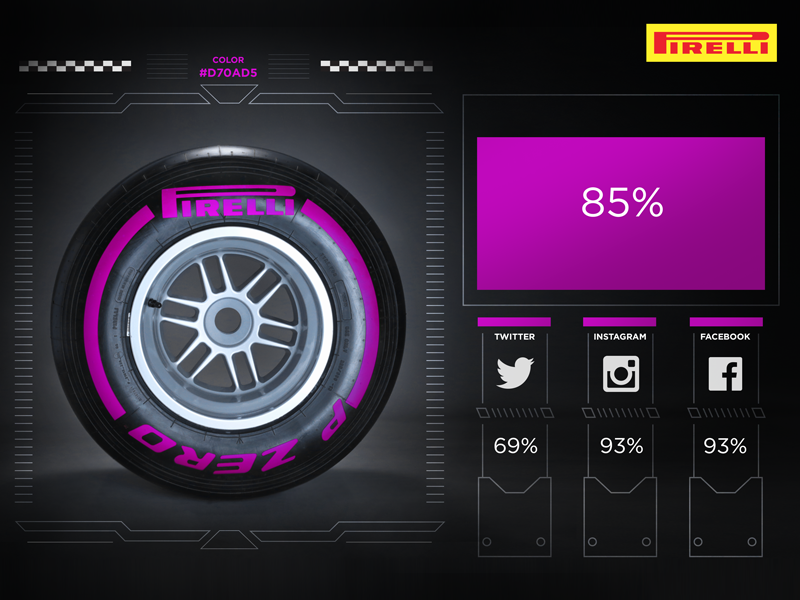 It’s incredible to see that half of the F1 tyres produced in a season don’t actually get used, and reassuring to see that 100% of tyres produced are recycled. After its meeting in Paris, yesterday, the FIA World Motor Sport Council formally approved the new 2016 Tyre Regulations for Formula One. 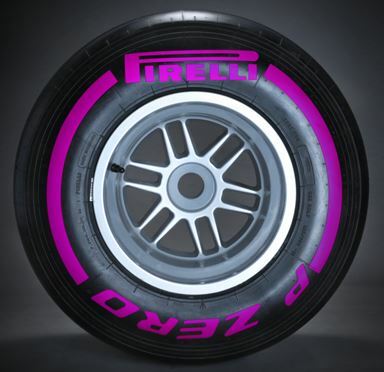 The new regulations will apply only to the slick tyres. The rules regarding intermediate and wet tyres remain unchanged. With the introduction of the new ultrasoft compound (which uses purplemarkings) the total number of slick compounds rises to five. The two mandatory sets nominated by Pirelli cannot be given back during practice and must be available for use in the race. At least one of these two setsmust be used during the race – but the teams can decide which one. In the FIA World Motorsport Council meeting, held today in Paris, approval has been granted to the President to formalise the contract between the FIA and GP2 promoter to establish the FIA Formula 2 Championship. This mover will complete the FIA’s single seater pyramid from Karting through the Formula One. The WMSC minutes do not reference a timeline to support the transformation, but 2016 is likely. Any changes around the GP3 series have not been referenced. F2 will likely maintain current GP2 technical regulations and retain it’s support race place in 10 rounds of the F1 championship. Bernie Ecclestone and Flavio Briatore are the promoters and owners of the GP2 / GP3 series (incidentally they partners also hold the rights to the GP1 name) . Both series are powered by Mecachrome engines, branded as Renault in the GP2 series. Mecachrome are one of the manufacturers participating in the FIA’s recent request for an expression of interest in alternative engine supply within F1. It is possible this engine design could play a part in future engine development plans for F2. 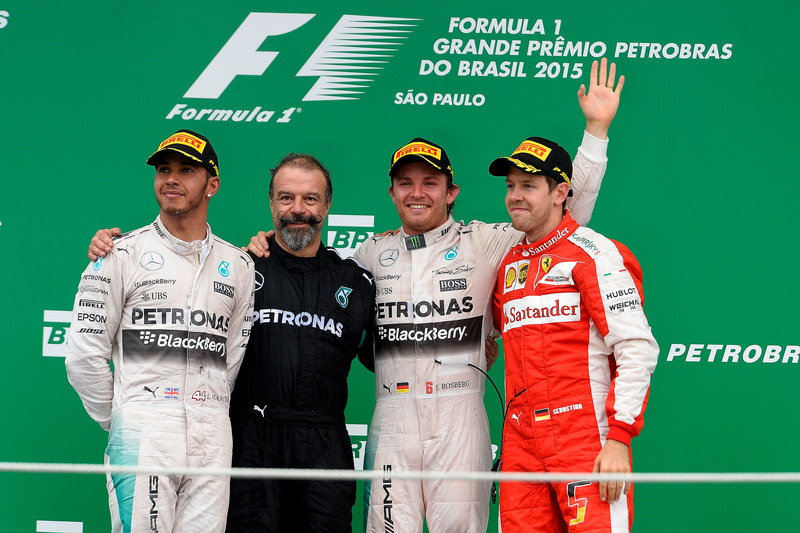 Mercedes driver Nico Rosberg won the Brazilian Grand Prix with a three-stop strategy, running one stint on the P Zero Yellow soft tyre followed by three remaining stints on the P Zero White medium tyre. Rosberg was able to hold off his team mate Lewis Hamilton – on a similar strategy – from start to finish, maintaining his advantage from lights to flag without losing the effective lead of the race. Track temperatures remained warm, albeit cooler than the 50 degrees seen during qualifying, while the threatened rain did not occur. The track temperature progressively dropped however throughout the race, ending up at 35 degrees, which reduced wear and degradation in the later stages. The top three all used a three-stop strategy, but there was a wide variety of tactics at work behind them. The highest-placed two-stopper by the end of the race was Ferrari’s Kimi Raikkonen, who used the strategy to gain fourth by the end of the grand prix, finishing just off the podium behind his Ferrari team mate Sebastian Vettel. All the drivers started on the soft tyre with the exception of Toro Rosso’s Carlos Sainz and Lotus driver Pastor Maldonado. The Venezuelan completed a long opening stint on his medium tyres, while Force India’s Nico Hulkenberg completed an even longer closing stint with the same compound – underlining the variety of strategic thinking in the closely fought race. Red Bull’s Daniel Ricciardo also adopted an alternative strategy to climb seven places from his grid position, switching from soft to medium on lap two. 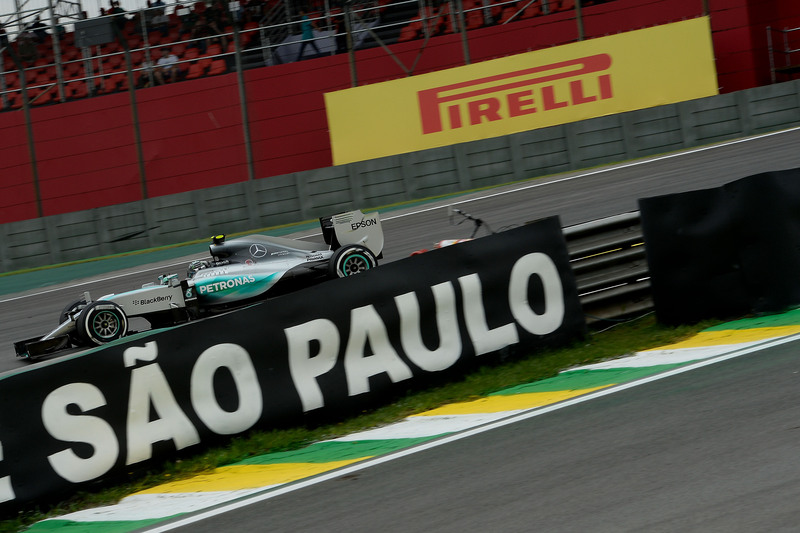 Mercedes drivers went first and second in both free practice sessions at Interlagos, with Lewis Hamilton using the P Zero White medium tyre to go quickest in the morning and Nico Rosberg setting fastest time of the day on the P Zero Yellow soft tyre in the afternoon. Today was the first opportunity that the teams had to assess tyre wear and degradation on each compound heading into the Brazilian Grand Prix weekend: traditionally a key factor, due to the constant cornering during a short but frenetic and bumpy lap. As is often the case at Sao Paulo, the weather conditions were inconsistent, with warm track temperatures in the morning but light rain at lunchtime, which dried up before the start of FP2. The drivers used the morning FP1 session to reacclimatise to the track and determine the behaviour of the medium tyre, in ambient temperatures close to 30 degrees centigrade. In the afternoon, both the medium and soft tyres were used during FP2: complete with some long runs to assess wear and degradation on each compound with different fuel loads. With a high risk of rain returning, the teams were all straight out on track in FP2, aiming to maximise the opportunity of collecting useful data. The session times were slower than their equivalents in 2014, due to a dirty surface and some damaged kerbs to last year, which meant that the drivers modified their lines in order to avoid them.